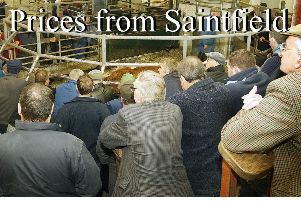 A small entry of stock saw steers peak at £1,350 for 620kg Charolais (218.00). Heifers peaked at £1,170 for 625kg Aberdeen Angus (188.00). Dropped calves cleared to £375 Hereford bull and heifer calves to £330 Aberdeen Angus. Weanlings topped at £785 for 375kg Belgian Blue bull (209.00) and heifers sold to £690 for 390kg Aberdeen Angus (178.00). Steer prices peaked at £1,350, 620kg Charolais (218.00) presented by M Donaghy, £865, 420kg Blonde d’Aquitaine (208.00); F McNally £1,205, 615kg Hereford (196.00), £980, 500kg Aberdeen Angus (196.00); J and M Greenaway £1,100, 575kg Blonde d’Aquitaine (192.00), £1,040, 540kg Charolais (193.00) and J McKee £995, 515kg Hereford (193.00). Heifer prices cleared to £1,170, 625kg Aberdeen Angus (188.00) presented by R Cunningham, £1,045, 540kg Aberdeen Angus (194.00), £995, 510kg Aberdeen Angus (195.00), £990, 520kg Aberdeen Angus (190.00), £975, 510kg Aberdeen Angus (191.00), £930, 485kg Aberdeen Angus (192.00); M Donaghy £970, 495kg Limousin (196.00) and E McVeigh £875, 425kg Charolais (206.00). Dropped calf quality was not as good as of previous weeks with stronger calves selling to £375 Hereford bull presented by W and W Conn, £315 Hereford bull, £310 x 3 Hereford bulls, £255 Hereford bull; S McMullan £280 Limousin bull, £250 Aberdeen Angus bull, £220 Aberdeen Angus bull; C Kelso £245 Aberdeen Angus bull; T Sterling and Sons £235 x 2 Fleckvieh bulls, £230 Fleckvieh bull, £220 Fleckvieh bull; reared Friesian bulls sold from £110 to £220. Meanwhile heifer Calves cleared to £330 Aberdeen Angus presented by M McCann; W and W Conn £300 x 2 Heredoes heifers, £260 Hereford heifer and D Lester £260 Limousin heifer, £220 Limousin heifer. A similar entry of weanlings saw male calves top at £785, 375kg Belgian Blue (209.00) presented by J Conway, £760, 330kg Charolais (229.00); R McAteer £595 x 2 300kg Limousins (198.00), £450, 195kg Simmental (231.00); while weanling heifers topped at £690, 395kg Aberdeen Angus (175.00) presented by D Hammond, £645, 345kg Aberdeen Angus (186.00), £640, 290kg Charolais (222.00), £635, 325kg Charolais (195.00), £635, 300kg Charolais (212.00) and J Conway £675, 315kg Charolais (214.00).